Healthy and delicious, fish is also incredibly versatile. We show you six different ways to cook it and three classic recipes that are quick and easy to make. It's so much easier than many people think. The main threat to successful fish dishes is overcooking. Fish cooks very quickly, so keep a careful watch on it and don't answer the phone midway through! Perfectly cooked fish will look opaque and be moist and succulent, with the flesh just starting to form glossy flakes - a step too far and the results will be too dry, with the flakes falling apart. So how do you cook perfect fish? For a start, buy it absolutely fresh and, to appreciate it at its best, try to cook and eat it on the day that you buy it. Jeremy Ryland-Langley, our fish buyer, goes to great lengths to ensure that the fish you buy from us is among the freshest and of the highest quality available. Once you have chosen your fish, you are spoilt for choice when it comes to cooking it, as most fish can be treated in many different ways. See below for our guide on the different techniques you can use and which type of fish works best with each. Try some of these methods for yourself. We have three classic recipes: fried skate with black butter and capers, grilled halibut steaks with tartare sauce, and omelette Arnold Bennett, made with tender, poached smoked haddock fillet. Grilling under fierce heat seals in flavour. To charcoal-grill or barbecue fish, first brush with oil to stop the fish from sticking, then season. Small whole fish, thick steaks and fillets all cook well under the grill. Slash sardines and mackerel with a knife before cooking to allow the heat to penetrate to the centre. Salmon, trout and sea bass are good, or see the halibut recipe below. 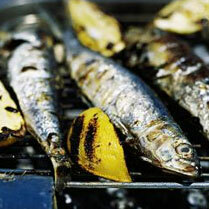 A high cooking temperature will give a crisp skin and quickly cooked centre, ideal for oily fish such as mackerel. Baking with herbs and a little oil or butter at a lower temperature gives a slower-cooked, moist finish. Thick fillets, such as cod, haddock, monkfish, whole salmon and trout, are all suitable for roasting or baking. Bake salmon fillets or delicate halibut wrapped in foil. Frying fish that has been dusted with flour or dipped in batter or a crumb coating seals in its flavour and moisture, giving soft, juicy flesh inside and a crisp coating on the outside. Deep-fry larger pieces of fish in batter at medium heat. For goujons, cut sole fillets into strips, crumb and fry very hot. For shallow frying, see the skate recipe below. Poaching produces moist, tender fish. Pour water, milk or a court bouillon (flavoured cooking liquor) over the fish to cover, and add a little butter and white wine. Poach on the hob or in the oven until the fish is just done. Fillets and steaks, skate wings or whole flat fish such as salmon, trout, sole and sea bass are all superb poached, as is smoked fish (see omelette recipe below). Steaming is ideal for fish, as the finished result is moist, delicate and very healthy, due to the fact that you don't need to add any butter or oil. Use anything from a simple fold-out metal 'fan' to a Chinese-style bamboo steamer or electric steamer. Small to medium fish, such as trout, can be steamed whole. Cut larger fish into medium to thick steaks or fillets. Using a microwave is the quickest way to really bring out the delicate taste of fish. The moist atmosphere cooks it quickly and locks in flavour. Choose evenly sized steaks and fillets and be aware that it is easily overcooked as food continues to cook after you have removed it from the microwave. Check your manual - it is better to return the fish for 30 seconds than overcook it.